5 (Romford Market & Canning Town) Awarded to Go-Ahead Blue Triangle using existing fleet 2010/11 diesel double-decks currently on routes 19,249,259,EL1 and EL2, plus new Euro-VI diesel double-deck. Currently operated by Stagecoach East London with Dennis Tridents and ADL E40D double-decks from Barking (BK) Garage and ADL E40H hybrid double-decks from Bow (BW) Garage (contract start date 26th August 2017). 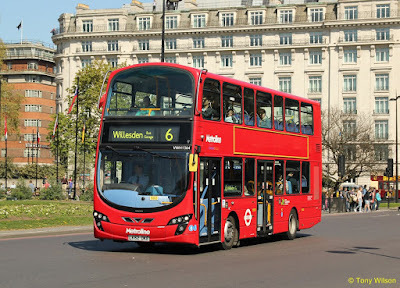 6/N6 (Willesden Garage & Aldwych) Re-awarded to Metroline Travel with new Euro-VI hybrid double-decks (9th December 2017). 15 (Trafalgar Square & Blackwall Station) Awarded to Go-Ahead Blue Triangle using current 2015 Euro-VI Wrightbus New Routemasters. Currently operated by Stagecoach East London with the Wrightbus New Routemasters from Bow (BW) Garage (26th August 2017). N15 (Trafalgar Square & Romford Market) Awarded to Go-Ahead Blue Triangle using current 2015 Euro-VI Wrightbus New Routemasters. Currently operated by Stagecoach East London with a mixture of diesel and hybrid ADL E40D and E40H double-decks from Bow (BW) Garage (26th August 2017). 18 (Euston & Sudbury) Awarded to London United using existing fleet 2016 Euro-VI hybrid double-decks, plus new Euro-VI hybrid double-decks. Currently operated by Metroline West with Volvo B9TL diesel double-decks from Willesden (WJ) Garage (11th November 2017). 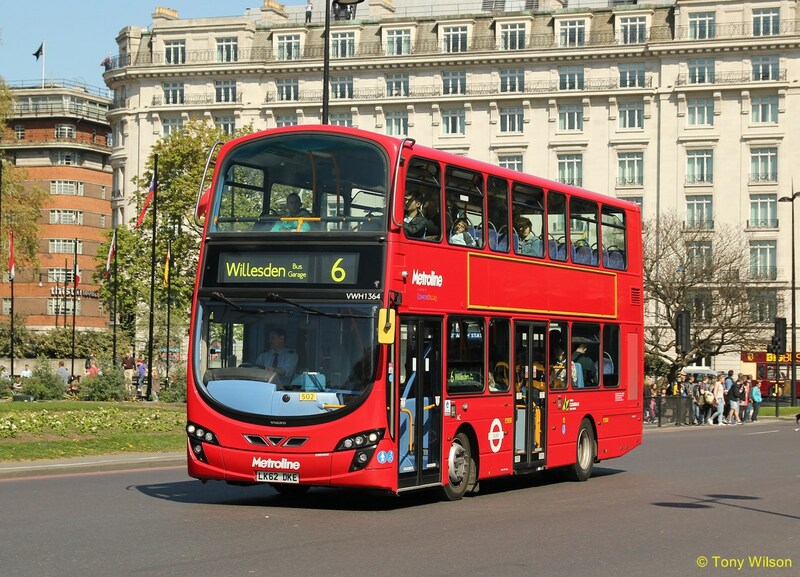 N18 (Euston & Harrow Weald) Awarded to London United using existing fleet 2016 Euro-VI hybrid double-decks, plus new Euro-VI hybrid double-decks. Currently operated by Metroline West with Volvo B9TL diesel double-decks from Willesden (WJ) Garage (11th November 2017). 22 (Putney Common & Piccadilly Circus) Re-awarded to Go-Ahead London General with 2012 Euro-V diesel double-decks upgraded to Euro-VI, plus new Euro-VI hybrid double-decks (21st October 2017). N22 (Piccadilly Circus & Fulwell) Re-awarded to Go-Ahead London General with 2012 Euro-V diesel double-decks upgraded to Euro-VI, plus new Euro-VI hybrid double-decks (21st October 2017). 98/N98 (Willesden Garage & Holborn) Re-awarded to Metroline Travel with new Euro-VI hybrid double-decks (9th December 2017). 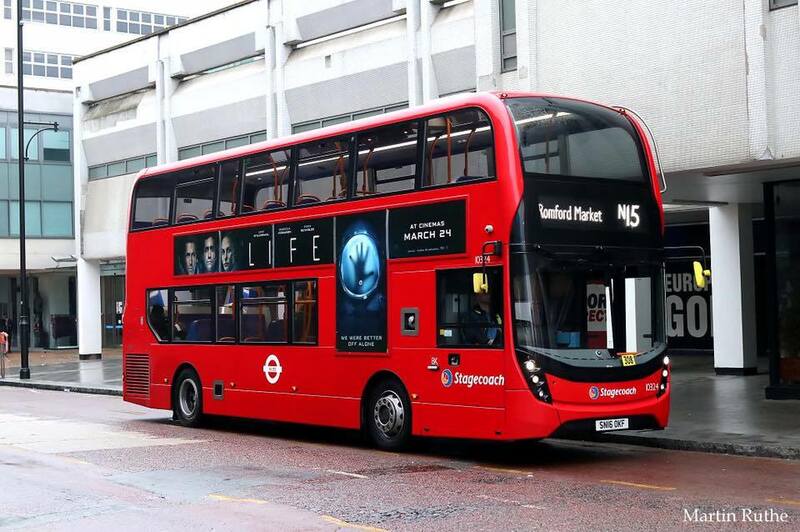 115 (Aldgate Station & East Ham) Awarded to Go-Ahead Blue Triangle with new Euro-VI hybrid double-decks. Currently operated by Stagecoach East London with ADL Trident double-decks from West Ham (WH) Garage (26th August 2017).